If they can bring back The Wombles, let me ask if it’s also time to revive The Banana Splits? Both were children’s shows, in case you were wondering…. UK composer and Wombles creator Mike Batt has revealed big plans for a new movie, new TV series and even a Womble World interactive experience. 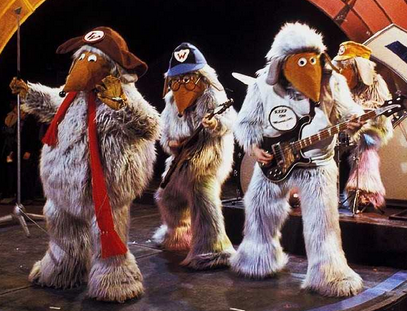 The Wombles were a furry 1970s UK TV hit, who went on to film and chart success. The Guardian reports Batt recently gained a controlling interest in Wombling Copyright Holdings, the company that owns the creatures and is now angling for a major relaunch. Batt previously enjoyed a 50-50 share of the company with the estate of the author Elizabeth Beresford, who wrote the original Wombles story back in 1968. “We have plans for two new 26-part TV series, a feature-length movie and an interactive Womble World experience,” he announced. Batt cut his teeth writing songs for the Wombles‘ BBC TV show in the mid-1970s. The Wombles went on to enjoy a string of UK chart hits, including Remember You’re a Womble, and featured in the 1977 movie Wombling Free, which co-starred Frances de la Tour and Bonnie Langford. 1 banana, 2 banana 3 banana 4……. or Underground overground wombling free, the wobbles of Wimbeldon Common are we! Along with Mr. Blobby i consider these things hella creepy. Maybe HR Pufnstuf could get a return. That was my favourite as a kid. It was also created by the Kroffts. The ecological-friendly side of the Wombles has never been more relevant. They did a really great special in 1990, still narrated by Bernard Cribbins. Well, if Number 96 can come back as Wonderland I guess the Wombles and the Banana Splits can do it too. My preference is for the Splits. The Banana Splits were American, not UK. Created by Hanna-Barbera and Sid & Marty Krofft. Thanks Tex. Considering myself slapped. I loved The Wombles! I can’t wait to introduce them to my niece.